Abstract: In this talk, I will propose and demonstrate the use of Fabry−Perot cavities as a means to augment the enhancement factor in surface-enhanced Raman spectros- copy (SERS) and tip-enhanced Raman spectroscopy (TERS) experiments by optical interference. Using both clean-room and bench-top fabrication approaches, we show that such a design can be readily realized and provides an additional 12× SERS enhancement and 5× TERS enhancement, in good agreement with expectations from electromagnetic modeling. The mechanism of optical interference enhancement is of far-field nature and is independent of the enhancement mechanisms relying on plasmonic and molecular resonances. Therefore, the Fabry−Perot cavity substrate can be applied generally without material and molecular limitations. The Fabry−Perot cavity structure provides enhancement at large incidence angles away from the surface normal, particularly suitable for low-light Raman measurements with side illumination. 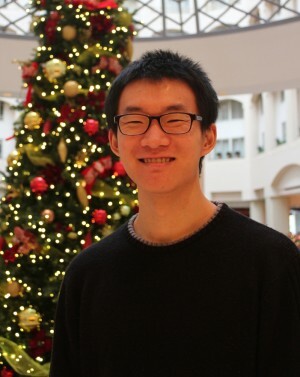 Bio: Yinsheng is a postdoctoral fellow working with Prof. Van Duyne at Northwestern University. His work in the Van Duyne group centers on the understanding and development of ultrafast nonlinear Raman spectroscopies and tip-enhanced Raman spectroscopy, as well as utilizing these advancements to investigate molecular events in plasmonic systems. Prior to Northwestern, Yinsheng obtained his PhD working with Prof. Louis Brus at Columbia University. His PhD work at Columbia focused on understanding the structural behaviors and electronic properties of heavily doped 2D materials. He also elucidated the strongly anharmonic structural dynamics of lead-halide perovskites and revealed how such an anharmonic lattice impacts charge carrier behavior. Abstract: Plasmonic metal nanoparticles can significantly enhance the electromagnetic field around them, which leads to the important spectroscopic application of surface enhanced Raman spectroscopy (SERS). Furthermore, hot carriers generated during plasmon decay process are utilized to drive photochemical reactions. Although plasmon driven chemistry has recently been of great interest in research community, detailed mechanisms are not well understood. In my talk, I will show a case study of plasmon driven electron transfer between gold nanoparticles and fullerene derivative PCBM. PCBM is known as an electron acceptor molecule and widely used in solar cell. With cw pump probe SERS experiments, the reduction behavior of PCBM is monitored. The reduction of PCBM induced by plasmon shows the dependence on the power of pump laser. Ultrafast ps pump probe SERS experiment on the same system indicates that the plasmon driven electron transfer probably happens at least on fs timescale. 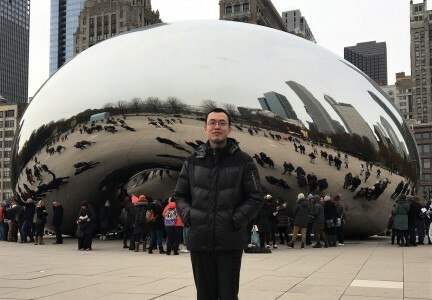 Bio: Yue Wu is a third-year Chemistry graduate student jointly advised by Prof. Van Duyne and Prof. Schatz in Northwestern University. He received his B.S. degree in Chemistry from Peking University, China. During his undergraduate, his research focused on chemical vapor deposition (CVD) synthesis and novel optoelectrical properties of two-dimensional nanomaterials. Now his main research interest is to study plasmon mediated chemical reactions with surface enhanced ultrafast Raman spectroscopy.